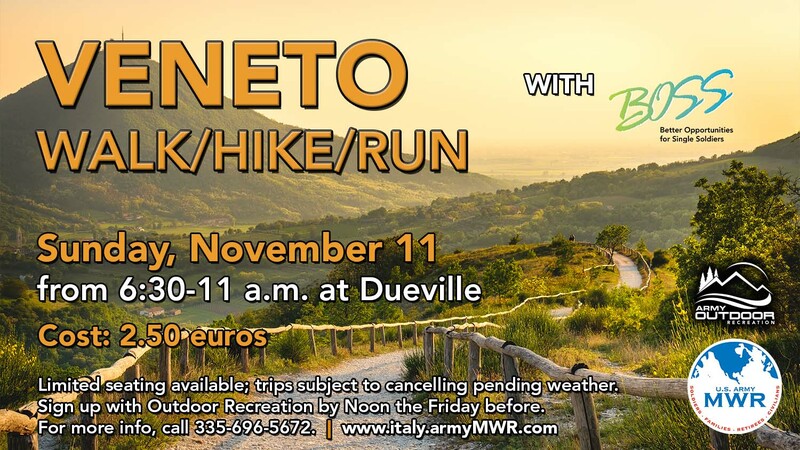 Date: Nov 11 2018, 6:30 a.m. - 11 a.m.
Once a month, single and geographically-separated bachelors/ettes can join BOSS outdoors to discover local surroundings and get some exercise. Enjoy nature, local culture and architecture in different locations in the Veneto region. BOSS takes you to the start location. On Sunday, November 11, BOSS is headed to Dueville! Limited space available. Sign up today!